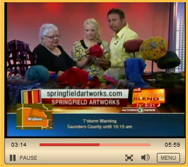 Photo of Margie's appearance on The Morning Blend Show, Omaha, June 2010. Springfield Artworks® is a contemporary boutique, studio and gallery that appeals to collectors, designers and students of glass, fiber art and millinery. The principal artists of Springfield Artworks, Margie and Glenn Trembley, bring their art genre alive in this small town setting. Springfield is located just 10 miles south of Oak View Mall in Omaha, Nebraska. The gallery specializes in glass art, and fascinator and Derby hats and accessories. The artworks you'll discover in the gallery include fused and etched glass objects, jewelry, fiber/wearable art, functional art and mixed media. All are available for purchase, providing an opportunity to enhance a home's décor through art and functionality. Ladies hats, hand-painted silk and felted scarves also abound, delighting the eye with color and style. Classes in glass art are offered at the studio, throughout the year. The gallery and studio are closed in January and open mid-February through December. Follow Springfield Artworks, Margie Trembley Hats and Accessories and Glass Art by Glenn on Facebook.